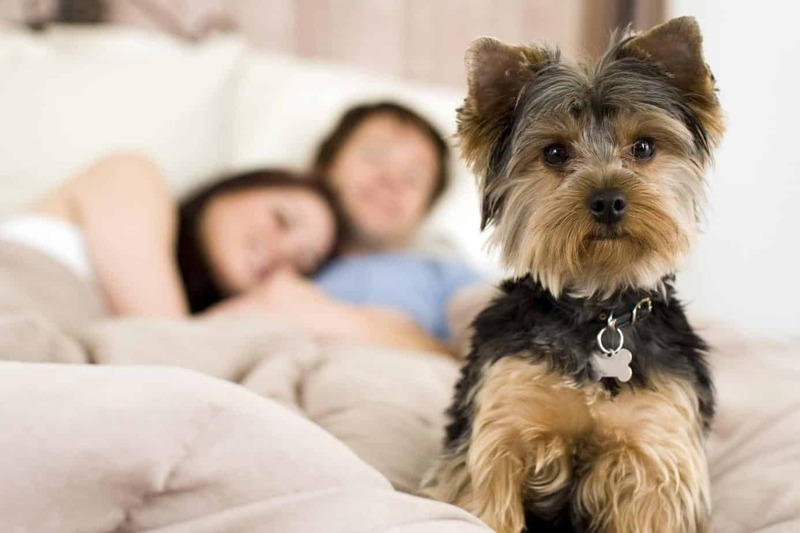 What do your dog’s sleep patterns mean? Like humans, dogs are mammals. That means our sleep patterns are similar — but they’re far from the same. Dogs sleep more than we do and their sleep cycles differ from ours. It’s not a cause for concern if your dog’s sleep schedule doesn’t align with yours. But if you notice dog sleep behavior that is unusual for your pet, you should rule out illness. 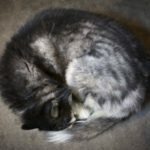 Dog sleep behavior: How much sleep do dogs need? At an average of 12 to 14 hours per day, dogs sleep far more than humans. 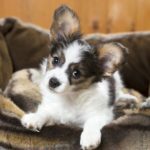 But it’s not unusual for dogs to sleep up to 20 hours per day at the puppy stage, and older dogs also need more sleep as they get worn out from the day. Of course, particular sleep needs for dogs depend on several factors, including their age, breed, activity level, size, and overall health. As a general rule, sedentary dogs will sleep more, so will larger breeds. Working dogs prefer to stay active and may sleep less, as do smaller dogs. Dogs sleep around the clock, but you may only notice them sleeping at night. Because domesticated dogs have flexible sleep schedules, they often adjust their sleep times, so they are awake and able to spend as much time with you as possible. That means they may sleep about eight hours each night while you’re resting, too. But they still need more sleep on top of that, usually at least four hours. They may make up that time while you’re away during the day, or nap during times when you’re less active or less apt to give them love and attention. Dogs spend most of their sleep time in an awake, but a readily alert stage. While humans spend 25 percent of sleep time in REM, dogs only spend about 10 percent of sleep time in REM. That means they get less deep, quality REM sleep and therefore need more time to get the rest they need. However, dogs get to REM sleep faster than we do, reaching REM sleep about 10 minutes into sleep. You might notice your dog dreaming in REM sleep, as they run or bark in their sleep, or you see small movements like twitching or moving their eyes. Light sleep in dogs is routine. They stay ready to wake at a moment’s notice in case they need to hunt or defend their pack. Sleeping at least 12 hours a day is normal for dogs, and you shouldn’t be surprised if they go in and out of sleep throughout the day. They may align to your schedule, but still, sleep more, so you may feel like they sleep a lot, but they’re just adding to the sleep time they get at night. 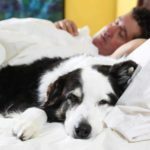 You can help support healthy sleep for your dog with regular activity and stimulation, and of course general healthy habits like scheduled vet checkups and a healthy diet. 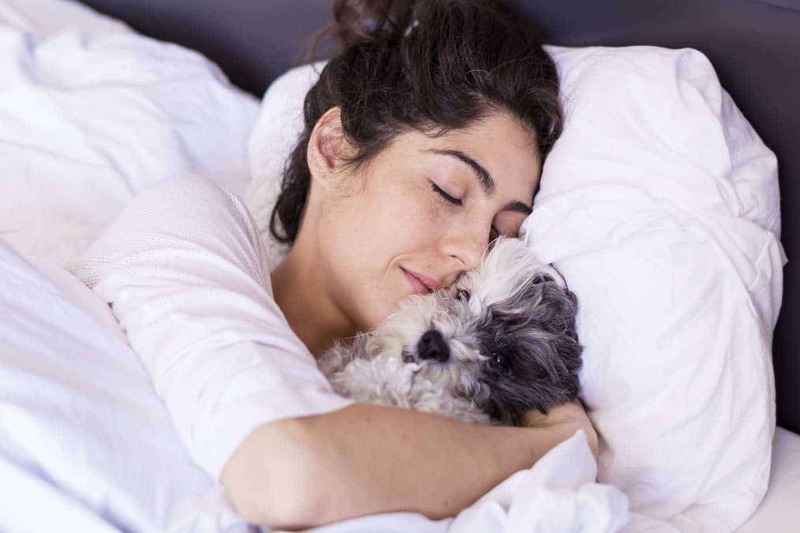 As dogs do often get the bulk of their sleep at night when you’re sleeping, prepare them for a good night of sleep with a healthy sleep environment, and meet their needs for food, bathroom relief, and attention before bed so they can go to sleep without concern. 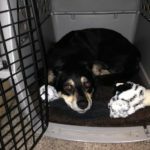 If your dog’s sleep habits seem unusual to you, or they’ve changed recently, it’s worth checking out. Talk to your veterinarian to rule out anything serious, as excessive sleeping or sleepiness could indicate illness. Jackie Kepler is a MattressReviews.net sleep professional. She enjoys sleeping with cats but sleeps on a king size bed because she needs her space, too.